Slazenger Double Mercerized Mens Golf Shirt - double the strength, double the winner! Slazenger is a brand that can be trusted. A brand of prestige and authentic quality. Slazenger golf shirts will hold their new and fresh look well into the years. Want a golf shirt that can be kept in wardrobes for years to come and still look brand spanking new each time? A Slazenger golf shirt is your solution. When you buy a Slazenger golf shirt, you are buying into the brand, a brand that holds respect and roots of genuine quality. Cotton golf shirts offer an easy fit that is soft and comfortable. A cotton golf shirt is long lasting and made from high-quality materials. Cotton is a strong fibre with a silky smooth finish for ultimate comfort. Wear a golf shirt that can brings good feelings and ease. Whether you're wearing it all day long working hard or pitching until all hours on the course, a cotton golf shirt will have your back, literally! Mercerized golf shirts came to exist thanks to John Mercer in 1844 in England. He developed the process of treating cotton fibres with sodium hydroxide. His manufacturing procedure of the fibre, shrank the fabric's dimensions which as a result made the material strong and easy to dye. Mercerisation enables a durable fabric and creates a lustrous finish. Mercerized golf shirts have a polished and elegant look that are bound to help your brand or company soar to new heights. Golf shirts made from a mercerized material offers a luxury look and strong quality. With fabric that is produced to last and a fabric made to impress, you'll have all your employees shinning like gold and your clients smiling with a blink in their eyes. A mercerized golf shirt makes the perfect corporate gift for those special and executive clients to show your gratitude and appreciation. Gain loyalty and support, as you impress and delight with a mercerized golf shirt! Gifting plays a big role within your brand, organisation or company's business strategy. It is a vital part of giving thanks, encouraging business and partnership or strengthening existing relationships. Gifting forms part of your company's integrity and commitment to your clients. Benefits of corporate gifts include; growing your brand or company's name, expanding your brand reach, exposing your business to potential clients and continuing the ethos and values of your business. Thinking of adding a mercerized golf shirt as part of your corporate uniform? Good thinking, it's the perfect fit! With its sleek and sophisticated look, you'll take professional to the next level! 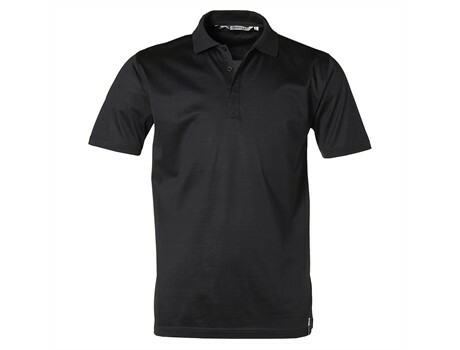 Mens black golf shirts offer a classic look and professional touch to any outfit. Simply add a black golf shirt to your corporate uniform to represent an image of finesse. A black golf shirt is an effortless choice for making any impression memorable and help finish your corporate look.